This piece has turned up in amongst some Lego I have been given. It is quite heavy and looks as though it should be part of a spaceship or something but I cannot find the Lego mark on it. I have found half a dozen random small non lego bricks too so wondering if it is actually something else. If so I will chuck it out. It's listed on brick link as being part x149 boat keel. 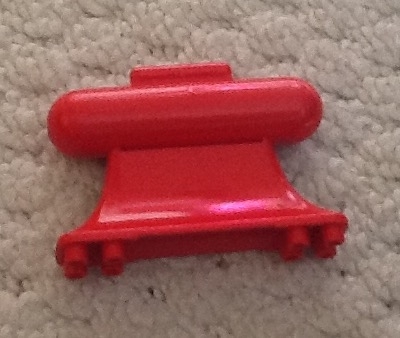 It is a Lego poece indeed... a weight for the bottom of boats, from a few decades ago. Why no lego stamp then? I've not been in the game long, sticking my neck out to say not Lego. 1980s boat weight, fire boat I think used them from the mid 80s. They can then float in the bath... Might have that in the loft and easy to get to, so will compare tomorrow if I can. Not sure why it doesn't have Lego stamped on it somewhere but apparently the red one came in 5 different sets and 2 service packs. Whether having the weighted part moulded into it meant it was processed elsewhere or they were unable to process it using the same type of moulding machines is something @Istokg may be able to shed some light on. Thanks. I will have a look then and see if I can identify any other bits I have which might relate to it. Grandson will LOVE it if a lego model can go in the bath! It is a weight that goes onto the bottom of the LEGO boat hulls I believe to keep the buoyancy so the boats don't just tip over in the water (as they were rather small and thin hulls). I have now looked what else I have and I think it may be a police boat from 1976 as I also have some transparent slope bricks and some of the original lego men with no moveable arms or legs and no faces plus basic bricks of the right shape and colur. Outside of the boat is missing though..... Sigh .... i can see how you all get hooked on this! @Chris23005, as mentioned above, this is going to be from a Fire Boat. I had a Police Boat when I was a nipper and I'm sure the weighted keel came in black. Thanks. Sadly it looks as though this one might be difficult to recreate easily due to its age but I will hold on to it and hope ..... Just found a blue tipper truck piece on bricklink though and that dates back to 1976 too so think some of this lego must have been handed down to my friends children. When i was typing that it would have been the first post. By the time I pressed the button I had been tree'd twice. I had this when I was 6 years old forty years ago. It is a part of the fire boat. I played with it in the bath. It was awesome. Thinking about trying to reaquire it at some point. I have some hull pieces (not in great shape though) you can have them if your happy to pay for postage. I'm away this weekend but will post some pics when I get back to mine on Tuesday evening or Wednesday. Ooh that sounds like a plan ..... What do you mean by not in great shape though? Marked, dirty or broken? I am away for a few days as from Tuesday so no rush although I should have wi fi where I am going. Whilst I appreciate that many of you are collectors and may like to rebuild an item and then display it, the lego I am collecting is for playing with. Grandson is almost 7, an avid lego person and this is a little project for us to restore old kits, hunt down pieces and generally have respect for it and learn something about the history of lego rather than it just be another plaything which gets discarded after the novelty has worn off. The final boat will be played with on his regular visits. ...... In the bath ...... So a few marks or discolouration/dirt dont matter but if broken I have to be aware of sharp pieces or whether it affects its playability, lol! This part was a ships keel that was first introduced in 1973 in LEGO boats 310, 311, 312, as well as LEGO Minitalia boat sets 30, 31 and 32. It was used again in 1974 in the ultra rare 1650 Maersk Like Container Ship... before being redesigned a bit with the extension on the bottom (as seen here)... and used in 7 further ship sets from 1976-85. LEGO in and of itself does not float... but the airtight variations of the x145 (ships bow), x146 (ships hull) and x147 (ships stern) parts is what does allow these ships to float... but only when weighted down with these weighted keels. From memory, slight discolouration and a couple of bits broken off but think I had two ships as there are a couple of front and end bits, will send you pics when I'm back at mine and won't be upset if you don't want them! That is more or less true. If you pop a 2x4 into water, and make sure you get all the air bubbles out of it, then it will sink. However, there are other parts that will float (Bionicle Zamors, large balls, life rafts, etc...). And if you stack a few bricks together, they will float. Yeah, if not said already, it attached to the bottom of the boat hull to keep the boat upright in the water. I had a police boat that had that part. Should have the boat in the storage downstairs. Used to have a few of them when i was a kid. Unfortunately no-one told me how much i would regret later to use them as hamer, they are way beyond "used" with bits broken off and such.